Volvo said it will launch five fully electric vehicles between 2019 and 2021. Electricity will power every new Volvo model starting in 2019, the Chinese-owned automaker announced Wednesday, making it the first major car manufacturer to pledge to leave the traditional combustion engine behind. Three of them will be Volvo models, and the other two will come from Polestar, Volvo’s performance car arm. Volvo said it will also introduce a host of new gas and diesel plug-in hybrids down the line. The company has yet to provide details on any of the models. “Volvo Cars has stated that it plans to have sold a total of 1 million electrified cars by 2025. “When we said it we meant it. This is how we are going to do it,” said Hakan Samuelsson, Volvo’s president and chief executive. The company said it will continue to manufacture its gas-fueled cars but will gradually phase them out of production. The Volvo D6 AWD Plug-in-Hybrid R-Design is seen at the 2014 AMI Auto Show on May 30, 2014 in Leipzig, Germany. Some experts question how quickly American consumers will adapt to the switch. “Buyers in the U.S. say they have interest in electric vehicles but largely buy sport utilities with gasoline engines,” said Michelle Krebs, executive analyst at Autotrader. Krebs said that the Chinese ownership of Volvo likely played a role in the announcement, considering China’s air pollution issues and the broader push for cleaner cars there and in Europe. But it’s less clear if commitments to build electric cars will lead to commercial success in the United States. Volvo claims less than 0.5 percent in U.S. market share, according to Kelly Blue Book. About 130,000 electric and hybrid cars were sold in the US from November 2015 to last November, according to ChargePoint, a company that operates electric-vehicle charging stations. That figure is dwarfed by total U.S. car sales from 2016, which totaled more than 17 million. Volvo’s announcement comes as major players in the auto industry are moving toward electric and hybrid models. Last year, Volkswagen announced plans to release 30 new electric vehicles by 2025. BMW recently said it hoped to boost the share of electric and hybrids models to as much as 25 percent of sales by 2025. The luxury automaker also reportedly plans to unveil an electric version of its popular 3-series later this year. Volvo’s pledge arrived on the heels of Tesla chief executive Elon Musk’s announcement that the first batch of Model 3’s — Tesla’s $35,000 entry-level electric car — will be delivered at the end of the month. 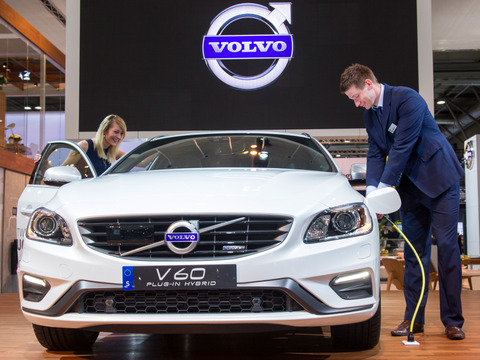 Volvo also said it’s aiming for its manufacturing operations to go carbon-neutral by 2025. Self Driving Cargo Ships To be Launched In Japan By 2027.